The mysterious warrior Beowulf (Christopher Lambert) arrives at a castle under siege. The surrounding soldiers kill anyone that attempts to leave. Inside, King Hrothgar (Oliver Cotton) leads a diminishing band of fighters against the monster Grendel. After joining the fight Beowulf slowly discovers the truth behind Grendel’s origins, and grows closer to Hrothgar’s daughter Kyra (Rhona Mitra). 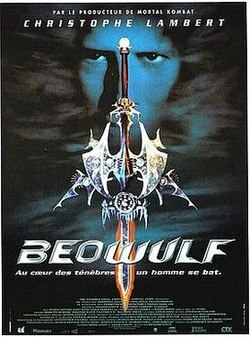 Graham Baker’s 1999 film adaptation of the epic poem Beowulf is a fairly dreadful thing. Its ambition is considerably larger than its budget, resulting in a film that looks absolutely dreadful – and to be honest, its ambition is not particularly lofty. The costumes and sets look cheap, the visual effects are unconvincing, and the cast generally look rather bored. I was bored and I only watched the thing; imagine how tedious it would be to have made it. To an extent this is a simple exploitation flick, with a villain skimpily costumed like a 1980s rock music video, an excessive of violence and gore, and Rhona Mitra all but having to share billing with her own cleavage. The problem is that an exploitation film really needs a lot of energy to keep it going; Beowulf really is a particularly leaden effort. Everything is half-hearted. The screenplay adapts the poem in a perfunctory manner. The early medieval setting is brought forward to a vaguely defined and weakly portrayed post-apocalyptic aesthetic. The beast Grendel is an unconvincing rubber-suit monster, but an effort is made to hit the weak design by adding a shimmering effect in post-production. One wonders why they bothered: the computer-generated villain at the climax looks like something from a first-generation PS2 game, and makes Grendel look rather respectable by comparison. Christopher Lambert always brings a certain degree of laconic charm to the screen, but even his legendary powers seem muted and bland. The same goes for Oliver Cotton’s disengaged performance as Hrothgar. German actor Gotz Otto, best known for playing a henchman in 1997’s Bond film Tomorrow Never Dies, brings a small amount of energy. Then there’s Rhona Mitra, trapped in the thankless role of ‘the girl’, forced to speak tough but never allowed to show it, acting her socks off in a desperate hope to impress: of the four, hers was the least established career and thus the one with the most at stake. It’s a wasted effort of course, but an appreciated one. She has pretty much made a career out of giving better performances than productions deserved. That she’s not as famous as the likes of Angelina Jolie or Charlize Theron is a terrible oversight on Hollywood’s part. The film is scored with electronic dance music co-composed by Juno Reactor’s Ben Watkins (with Jonathan Sloate). It’s also peppered with dance hits by a range of popular electronic groups. The music is discordant and intrusive, not because of the genre but because it simply never seems to match the tone of any given scene. It is an easy score to mock, purely because of how poorly incorporated it is. It is almost worth sitting through the film to laugh through its terrible climax, which seems to involve Beowulf jumping flips in slow motion for minutes at a time. It is almost worth it. Not much else in this film is. It must hurt everybody involved to have it sitting there, sullying their CVs.